Team New Zealand boss Grant Dalton sees high technology and "seriously brave" sailors as being features of the next America's Cup. New cup holders Oracle Racing of the United States and Italy's Club Nautico di Roma, representing the challengers, confirmed today that the next event would be in 2013 at a venue to be decided later this year. They said a new class of boat named AC72, a 72-foot (22-metre) catamaran, would replace the 25-metre ACC monohulls used in multi-challenger regattas since 1992. Like the giant trimaran that Oracle, owned by software tycoon Larry Ellison, sailed to defeat previous holders Alinghi of Switzerland in a bitter head-to-head clash earlier this year, the AC72 will have a wing sail. It will carry a crew of 11, compared with 17 on an ACC sloop, and be able to be sailed in a wide wind range of three to 33 knots, reducing the number of days lost because of not enough or too much wind. Organisers believe the AC72 could regularly clock speeds of above 30 knots, compared with the leisurely 11 to 13-knots achieved by the ACC boats. "There's no doubt the next America's Cup will be a high-technology race and the guys that sail the boats are going to have to be seriously brave," Dalton said. "There's some learning to do for sure." Dalton was happy that the year chosen was 2013 rather than any later, because it lessened the wait. 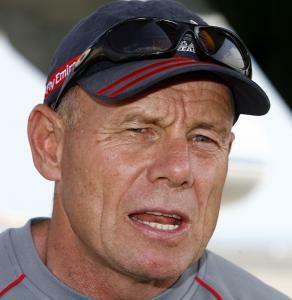 Since the last regatta involving multiple challengers back in 2007, the America's Cup has been in limbo while Oracle and Alinghi battled it out in the courts over proposed new rules before finally ending their dispute on the water. Dalton expected Team NZ to be at the next event, saying the primary purpose for which the syndicate had been formed was to win the cup for New Zealand. However, Team NZ would hold off on confirming their participation until they had gone through the protocol in detail and consulted with other challengers to ensure there was a fair playing field. "I would like to hope that we are in, but you can't discount the fact that we might not be," Dalton said. "Certainly we have to put all the pieces of the jigsaw together before making a final decision." While the size of the budget needed would be a consideration, he had no doubts about his team's ability to design, build and sail an AC72. Dalton has experience of competing in a multihull, having skippered the maxi cataraman Club Med to victory nine years ago in a round-the-world contest known as The Race. He said Team NZ were initially against switching the America's Cup boat from a monohull to a catamaran when it was first mooted, but was now more comfortable with the move. "It was fear of the unknown a little bit," he said. "But once you start understanding it, it doesn't feel so scary."